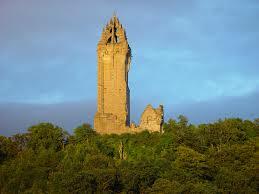 Monday, 24th June, 1861, was an historic day for Scotland, for the town of Stirling and for Freemasonry in Scotland. 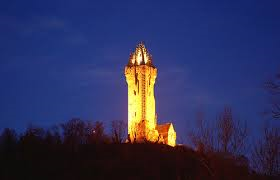 On this day, the 547th Anniversary of the Battle of Bannockburn, the Foundation Stone of the Wallace Monument (inset) was laid on the Abbey Craig at Causewayhead, Stirling. During the weekend and on the Monday morning a great number of visitors flooded into Stirling by what, at that time, would be every conceivable mode of transport - by large gigs, by cart, but mainly by rail. A great many trains arrived at Stirling Station and it was estimated that at least 15,000 arrived by this means, at least 10,000 by other means and estimates indicate that the numbers spectating along the route and taking part in the parade brought total attendance to more than 50,000. The Grand Master Mason, Brother 6th Duke of Athole, and the Office-bearers of Grand Lodge were met on arrival at the Scotia Central Railway Station by the Bannockburn Rifle Volunteers, who acted as a Guard Honour to Grand Lodge and conducted the Grand Master Mason and Office bearers to the Court Room in Broad Street where Grand Lodge was opened at 11 o’clock. The same Corps accompanied Grand Lodge through the day. The procession was marshalled in Kings Park and formed in the order marching. The procession started just after 1 o’clock when the signal gun was fired from Stirling Castle. Included in the procession were various representatives of municipal bodies throughout the county preceded by the Master Gunner of Dumbarton Castle, bearing the sword of Sir William Wallace, granted for the occasion by H.R.H. the Duke Cambridge and followed by pipers and a servant of the Earl of Elgin bearing the sword of King Robert the Bruce. The Masonic Lodges marched towards the rear of the procession, placed by seniority on the Grand Lodge Roll, followed by the Duke of Athole’s Instrumental Band and the Bannockburn Rifle Volunteers, in attendance on Grand Lodge, and finally the Grand Master Mason and Grand Lodge Office-bearers. It is estimated that 149 Lodges were represented by some 5,000 brethren and in the procession 13 operative members of the Lodge of Journeymen Masons No. 8, carried the working tools. The members of Lodge No. 8, also paraded the Blue Blanket on this occasion. 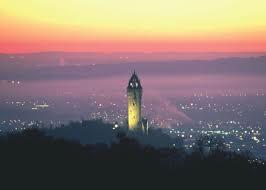 The main parties proceeded to the site of the Monument whilst the remainder waited at the foot of the Abbey Craig for their return. In customary fashion the cavity under the Foundation Stone contained many publications relating to the locality, the Monument and coins of the realm, together with the Masonic Calendar for 1861 and a Masonic inscription with a list of Grand Lodge Office-bearers.